Ever shop in the men's department? Me neither. I was in Gap with my dad, and he spotted this for me on the sales rack in the men's department! Who would have thought to look there? Not me. I guess that's the one advantage to shopping with a man! It's perfect for dressing down and grunging up a girly dress or skirt, like this floral F21 number. And the bracelet? It's even more neon in person! It's perfect for stacking and wearing alone...it's such a statement! Next on my list...a neon crystal necklace! Rocks Paper Metal has the perfect ones if you're looking for a statement necklace in spring and summery colors! So far, I've been pretty good about wearing colors, right? p.s. Congrats to KISTY for winning the Club Couture giveaway! I've got another fun one coming up with Vanessa Mooney. See how to get early entries, HERE. great skirt honey, i really love it!! I love the skirt and pretty much the whole outfit! New here and I will really make sure to keep checking your blog site every now and then. Thanks! Great arm candy too. I'll have to check out that site. Congrats Kisty! I'm looking forward to this next giveaway! Super cute! Loving the skirt! That was such a great find by your dad! Don't you just love finding things in the men's section! I always look! I love their scarves and jewelry! Love the bracelet with your outfit. Gorgeous! 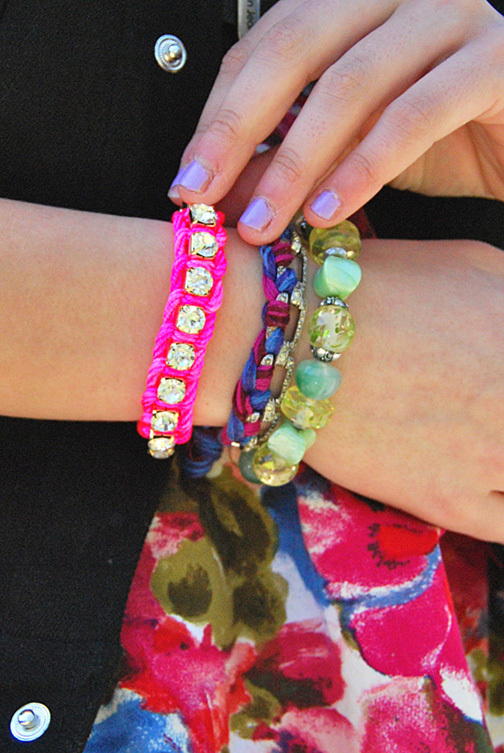 More than beautiful your OUTFIT...super cute bracelets. wonderful pictures. and i LOVE your bracelets. you look so pretty! I love those bracelets! 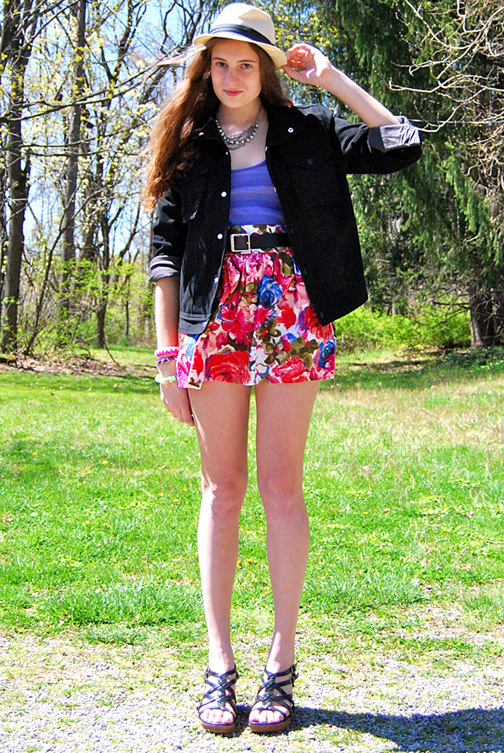 Love the colors and all your accessories! wow! that jacket fits you perfectly! that's really cool that it's from the men's department though! i get hat's in the men's department sometimes! I love your jewelry! Especially that braided/chain link bracelet.